Free Shipping Included! 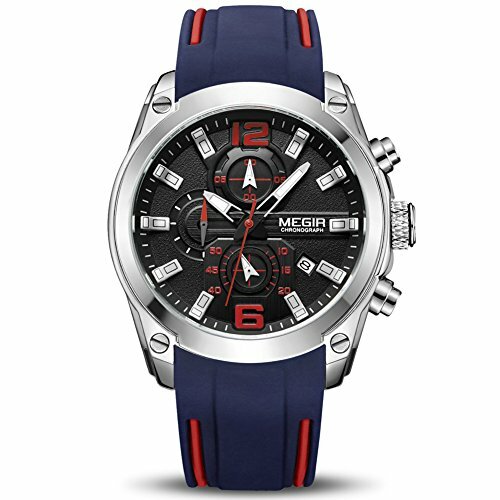 MEGIR Men's Quartz Wristwatch Luxury Fashion Chronograph Sport Business Gift for Male (Blue) by MEGIR at Watches Sales. MPN: MN2063GBE-1. Hurry! Limited time offer. Offer valid only while supplies last. 3ATM Water Resistant - Work watches for men, with waterproof depth to about 30m (Withstands rain and splashes of water, but NOT suitable for warm water, showering, diving, snorkeling or long time underwater activities), suitable for daily use. Purchase without worry - We will inspect each accessories of watch that we choose, after the watch to be made, it will be strict test to make sure the good condition.